One Verse. Once A Day. On Thursday, I was sweeping my dining room floors and a thought came to me. A thought which had nothing to do with my floors. But the busy of my mind is able to settle when I sweep. I had read it. I had prayed. But as far as His Truth touching the roof of my mouth…Nothing. I have many words in a day. I instruct children. I make phone calls. I greet parents at morning drop-off. I teach classes at the Y. I walk with friends. I sing in the van. I order food a Chick-fil-a. I ask my husband about his day. I plead for Mr. Bates on Downton Abbey. I have words. Many words. Some useful. Some not. But the most important, life-giving Words, on this particular Thursday, I had yet to say. My most important words I don’t even have to speak to anyone else… Just to myself. And back to Him. Sometimes, I may not speak the Bible because I don’t feel like I “know it”. You know? Like, maybe I won’t get it all verbatim. Or maybe I feel like I should only speak God’s Word if I plan to memorize it. When I sweep. Or when I drive. Or when I wash a pan. Do you find this to be true of you? Are your words many and His Words few? I invite you to join me on my ‘One Verse. Once A Day” journey. Here are the rules…there are no rules. Pick a verse. Or a part of a verse. And let that be your spoken Word for the day. Say that. Doesn’t it sound so good? It is true. He is your ANCHOR. When everything around is falling apart, He is our anchor, holding us steady. Keeping us stable. He is our hope, not only for salvation, but for everything. That can blow your mind if you let it. So there it is for today. My verse…Romans 5:5. I may not memorize it. I may even butcher it a couple of times as I say it. But the important part is that I say it. It can change me in a split second. And, bless God, it WILL change that split second where I want to bite my kids’ heads off. Oh Lord Jesus, thank you for Your WORD. Forgive me for neglecting the most powerful tool I have here on this Earth, Your spoken Word given to me. Useful in every way. For teaching. For reproof. For encouragement. For wisdom. Light. And life. You are so good to us, to equip us with a Sword, strong to fight and win every-single-one of life’s battles. 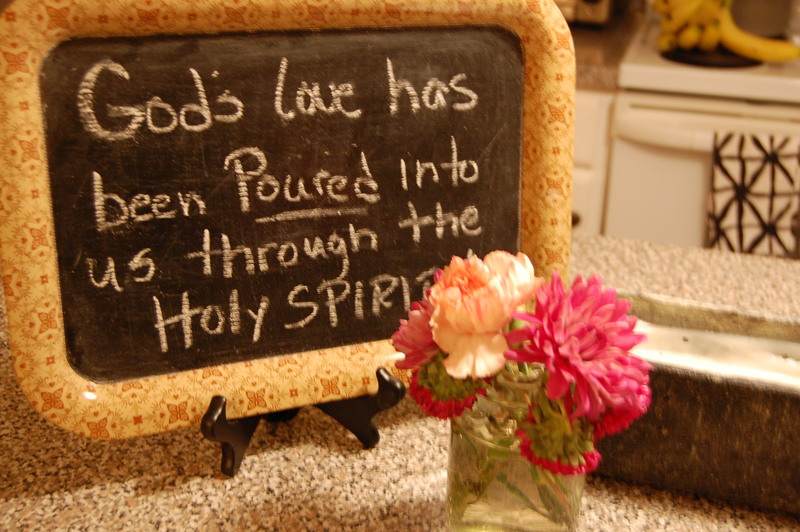 We are not defeated, but we are empowered by the washing of your Word. Let me be one who speaks it with boldness to a room full of people, yet still let it break the silence of my home, even as I sweep my floors. Let me remember the importance of letting it touch my lips. You are so good. I love you. 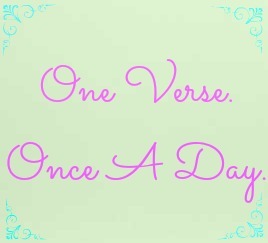 Leave a comment if you plan to join me on a “One Verse. Once A Day” Journey! What is yours for today? Very interesting! Just today while I was out running, I realized that when things are going badly, I get right in the Word, but when things improve, I tend to drop off. So, if I were God, what would I do? I’d make Ann have tons of bad things happen so that SHE STAYED IN THE WORD!!! So, wanting to avoid that line or reasoning, I thought maybe I should touch base with my Bible. Then, I read your post, and loved it! That will help me SO much! How funny that today I wrote down a verse on a nametag and stuck it on my arm for me to say today! I needed this…God is good. Thank you! How true that we NEED God’s Words on our lips!! I’ve been loving memorizing Psalm 145 these last few weeks and have found that speaking His Word out loud is so powerful!